The letter from Master Chen that Ryo carries in Shenmue II. What appears to be an early, unused version of this note was discovered in the game files, and its appearance is quite different, with lined paper being used. An early, unused version of the note from Master Chen. Apart from "Hong Kong" being dropped, it is interesting to see that Xiuying's real name is written here, rather than the name of "Lishao Tao." This suggests that this storyline element that was added later in the design of the second game. In the cut scene at the end of Shenmue I, Master Chen hands Ryo an envelope, one side of which (the reverse side) can be briefly seen. Master Chen holds the envelope containing the introduction letter. The written characters on the envelope are Master Chen's formal name: Yaowen Chen (陳躍文). However we are not shown the other side of the envelope, since control is not returned to the player to examine the item in Ryo's possession. 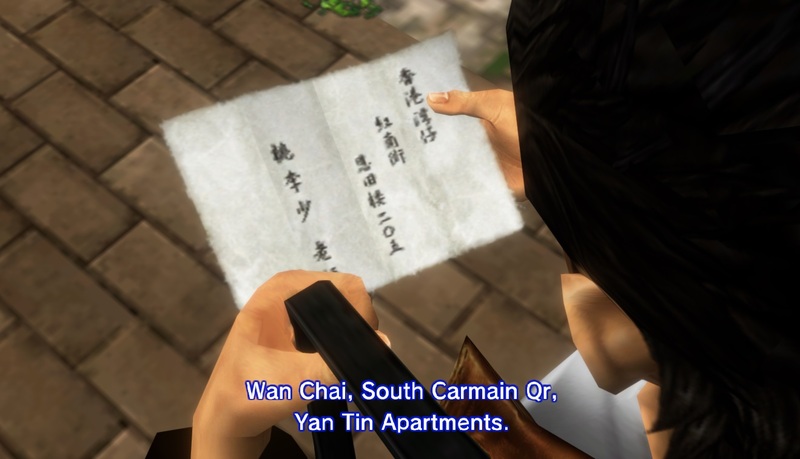 At the start of Shenmue II, Ryo is holding only the letter and not its envelope. The front of the envelope from Master Chen; normally not accessible. Written on it is "Master Lishao Tao" (桃李少老師). This can be recognized as being the front of the envelope since the five red boxes at the top-right are often printed on envelopes in Japan for writing the post code. Thus, during the cut scene we are shown only the reverse side. 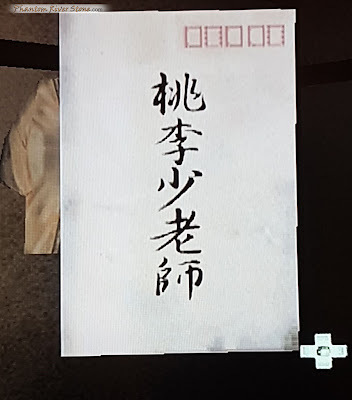 It can be conjectured that a decision was made not to reveal this name to the player prematurely at the end of Shenmue I, and hence this face of the envelope was deliberately kept concealed in the cut scene. An Earlier Version of the Envelope? In fact, there is a second, unused envelope texture on the disc. This one is present among the files of the What's Shenmue* disc - even though this demo was set only in Dobuita, various unused files were left on the disc. * What's Shenmue was the name of a playable demo for the Dreamcast that was distributed in Japan prior to the release of Shenmue I. It was set on Dobuita Street and involved a quest for Ryo to seek out a certain Mr. Yukawa, the former managing director of Sega, before the end of the day. (A fan-translated version of this demo also exists, which we will cover in a future post on the blog). An unused envelope texture is contained among the What's Shenmue files. Some key differences are immediately apparent. Firstly, Xiuying's surname here uses a different character (Li: 李), from the one in the game (Hong: 红). This indicates that this texture originates from earlier in the project's development, as it uses the early version of her name that we encountered previously when translating an early Shenmue II design document flowchart. Map of Hong Kong showing the real-life location of Tsim Sha Tsui, which may have been the location of Xiuying's apartment in the early design (highlighted in yellow). Wan Chai is located on the opposite side of the harbor. 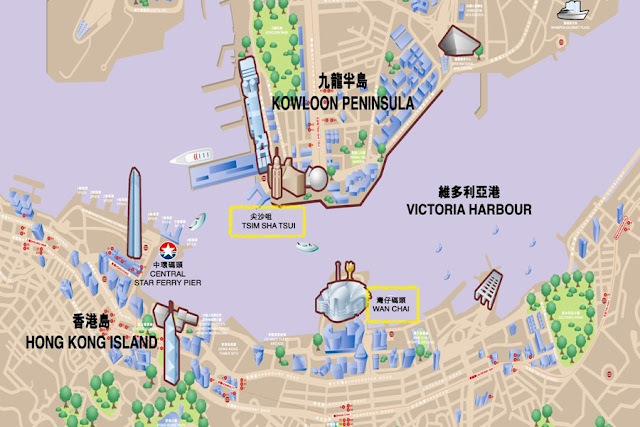 This again fits in with the earlier design, which had the boat on which Ryo travels arriving at Tsim Sha Tsui. So it would have made sense for Xiuying's apartment to be located somewhere nearby. Lastly, this version of the envelope is stamped with a postmark, as if it has been received at some time by Xiuying, and then has come into Master Chen's possession by some means. 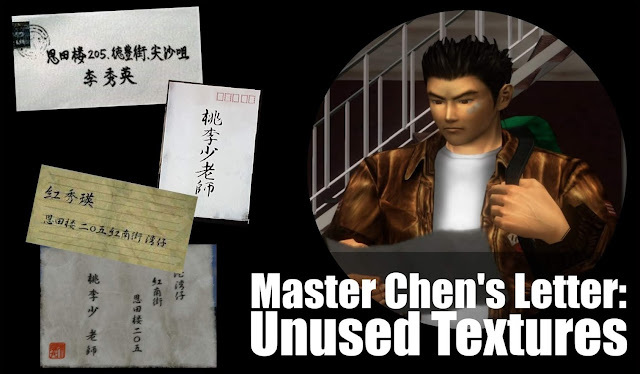 This would have neatly provided Ryo with all the contact information he needs without needing a separate letter inside, but it may have been hard to justify Master Chen being in possession of such an envelope. This may have been why the final design was to have a simple envelope with note enclosed for the released version of the game. Unused textures such as these give a fascinating insight into the early design process, and changes that subsequently occurred before the final release. The early unused textures on the What's Shenmue disc were discovered and extracted (many years ago!) 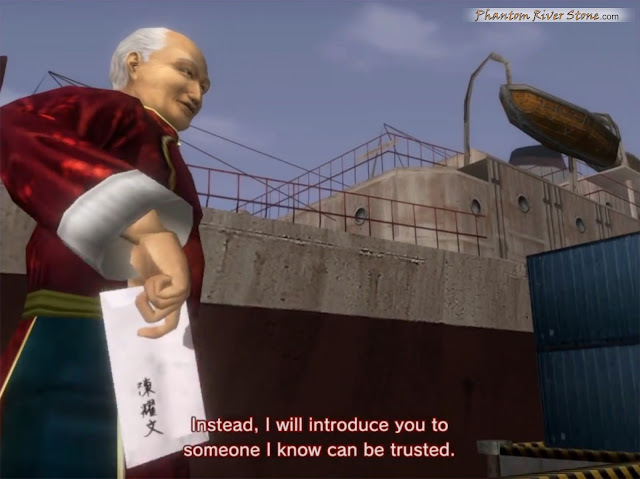 by LanDC from the Shenmue Dojo. 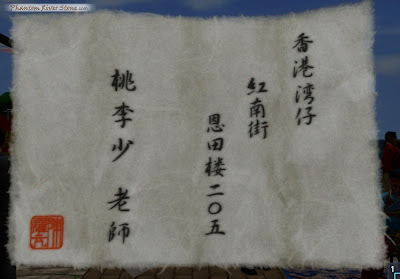 Peter Campbell kindly provided the image of the front of the envelope that Master Chen gives Ryo in Shenmue II.